What would it have been like to travel on a Victorian branch line? 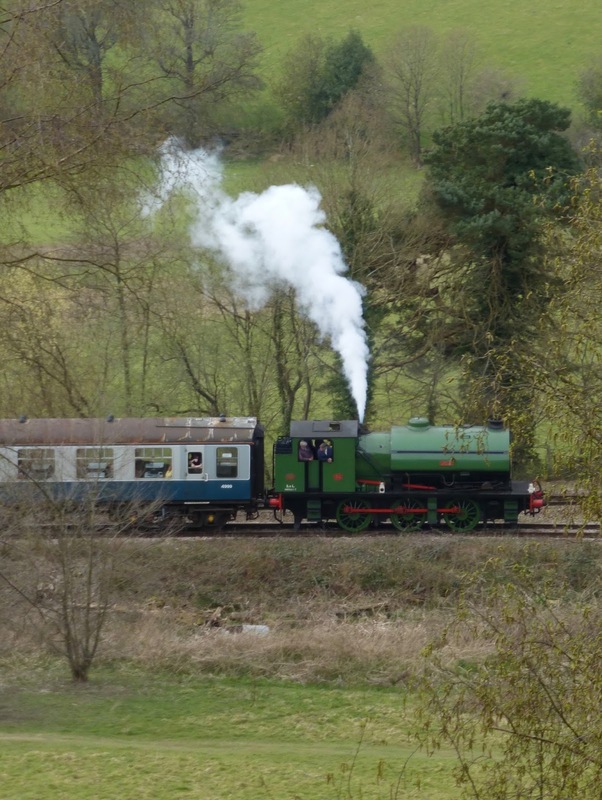 You can visit one of the many preserved steam railways up and down the country to get some idea, of course, but these are all careful exercises in nostalgia. To experience a quiet rural line in the modern era, try travelling on the line from London Bridge to Uckfield, which runs south from Oxted and Hurst Green through Edenbridge Town and then a series of isolated country stations to Crowborough and Uckfield itself. Get off at Hever, Cowden, Ashurst or Eridge and you have some idea what it must have been like to travel to such deep country halts in the nineteenth century. That this line exists at all is a true miracle, given that many other lines in this area disappeared in the 1950s and 1960s. The Uckfield line itself has been slated for closure more than once, but somehow survives to provide excellent jumping off points for rural walks. The line is in fact the last remnant of several which were built by the London, Brighton & South Coast Railway in the second half of the nineteeth century. They were fairly typical of late Victorian lines in that their profitability must always have been somewhat questionable. But their real purpose was to prevent rivals such as the South Eastern Railway and London, Chatham & Dover Railway from encroaching on LBSCR territory. The LCDR, for example, proposed in 1864 to build a line from Beckenham to Brighton, and in the same year the SER was talking of a line to Eastbourne. The response of the LBSCR was to extend a line it had already opened in 1855 from Three Bridges on its Brighton main line to East Grinstead (the first railway line to reach the town). In 1866 it drove this line eastwards via Forest Row, Hatfield and Groombridge to Tunbridge Wells West (so-called to distinguish it from the other Tunbridge Wells station, the one opened by the SER in 1846 - see South East to Dover - which in Victorian times was known as Tunbridge Wells Central and which is the station we still use today). The LBSCR used this new line to run trains from London to Tunbridge Wells, competing with the SER route via Tonbridge (then still known as Tunbridge: the spelling was not changed until 1893 to avoid confusion with Tunbridge Wells). Because SER trains at that date all still ran via Redhill - see South East to Dover - the new LBSCR route was only four miles longer. That changed in 1868 when the SER opened its cut-off line via Sevenoaks (see Bitter competition - and its benefits) making its route to Tunbridge Wells shorter, but the LBSCR put a brave face on it, marketing its line as "the pleasant route". Next the LBSCR started to build a line from Balcombe to St Leonards near Hastings, known as the Ouse Valley Railway. Construction had only been underway for a month in 1866 when the bankers Overend & Gurney collapsed, sparking a financial crisis that hit the LBSCR and other railway companies particularly hard. Work on the Ouse Valley Railway stopped in early 1867 and never resumed. Traces of it can still be seen on the ground to the east of Hayward's Heath. The LBSCR recovered from the crisis, however, and was soon back in construction mode. 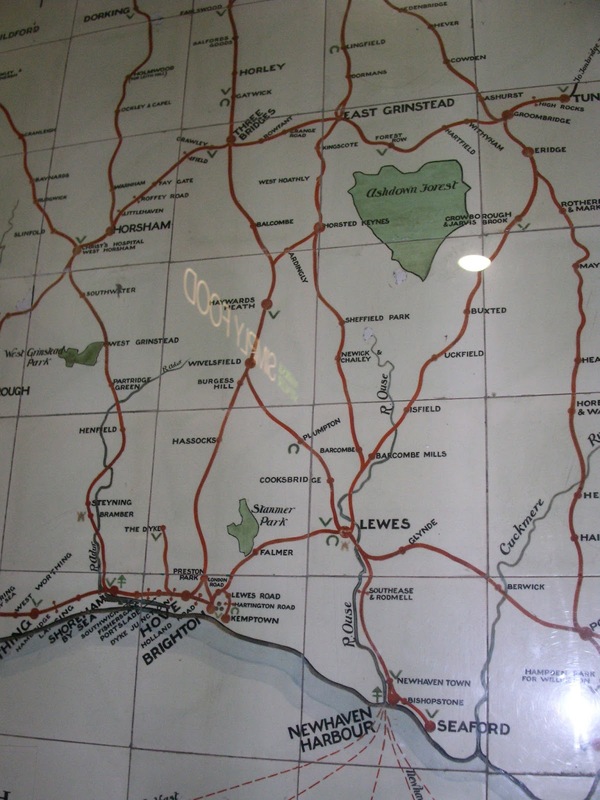 Previously, in 1858, it had opened a line from Lewes to Uckfield. In 1868 it extended that to Buxted, Crowborough, Eridge, Groombridge and Tunbridge Wells West. Further plans by the SER and LCDR to encroach on LBSCR territory followed in the 1870s but none came to fruition. In particular the SER continued to nag away at its plans for a line to Eastbourne. The LBSCR's response was a branch, opening in 1880, that ran from Eridge on the Tunbridge Wells to Lewes line down through Heathfield, Mayfield and Rotherfield to Hailsham, where it met up with a branch line coming up from Polegate. The following year a track between the two Tunbridge Wells stations was opened as part of a deal with the SER, which got permission to run trains via this link from Charing Cross down to Eastbourne. But it only used those rights for eighteen months (between April 1884 and December 1885) and for the rest of the Victorian era the link line between the two Tunbridge Wells stations was lightly used, with just five passenger shuttle services and one freight train a day in 1894. The Eridge to Polegate line - known as the Cuckoo Line, after the Cuckoo Fair in Hailsham - became a dozy rural route. While on paper it offered a more direct way from London to Eastbourne than the one we now have, it was never used by express trains. Another LBSCR line, opened in 1884, struck south from Croydon to East Grinstead via Oxted. It provided a direct route from London to a new low-level station in East Grinstead (the one we use today) and linked into a line opened in 1882 from East Grinstead to Lewes via Kingscote, West Hoathly, Horsted Keynes, Sheffield Park, Newick and Chailey and Barcombe. A year earlier, in 1883, a spur had also opened (whose trackbed still exists, now owned by the Bluebell Railway) from Horsted Keynes to Haywards Heath, with an intermediate stop in Ardingly. The northern part of this line as far as Oxted was also used by the South Eastern Railway, which had jointly funded the construction of this section. It built a link (now lifted, though it survived into the 1960s) from the line to its own Redhill to Tonbridge main line near Edenbridge, allowing it to run trains from Croydon to Hastings while avoiding congestion at Redhill (see Bitter Competition). The line onwards from Oxted to East Grinstead was mainly used by the LBSCR as a shorter route to Tunbridge Wells West. There was a curve - still in existence but now overgrown - which allowed trains from this line to get onto the Three Bridges to Tunbridge Wells line via the original (now lost) higher level part of East Grinstead station. One last LBSCR line, opened in 1888, went south from Oxted (or more precisely Hurst Green) to Edenbridge Town, Hever, Cowden, Ashurst, Groombridge and Tunbridge Wells West. This gave the LBSCR an even more direct route from London to Tunbridge Wells. It will be noted that the trains from Lewes, East Grinstead and Oxted all ran into Tunbridge Wells West. The three lines met at Groombridge, which was consequently a very busy station, with up to 200 trains a day. A link had also been opened in 1888 between Ashurst and Eridge bypassing Groombridge and allowing direct trains from Hurst Green to Uckfield, Lewes and Brighton but it was not in regular use until 1914. 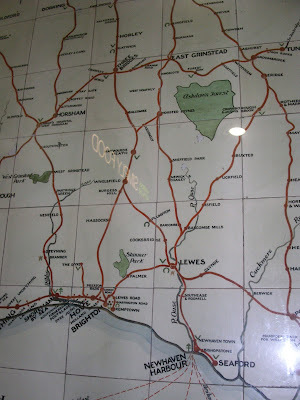 By the 1930s there was an "Inner Circle" route where 20 trains a day ran via East Grinstead and then either Haywards Heath or Lewes down to Brighton, and an "Outer Circle" where 12 trains ran via Oxted and Eridge to Tunbridge Wells West. This provided connections at Groombridge to Lewes and Brighton, or Eastbourne via the Cuckoo Line, but a few trains also bypassed Groombridge and Tunbridge Wells and and ran directly down the Ashurst-Eridge link to Lewes and Brighton. Some of these carried carriages which detached at Eridge and went down to Eastbourne on the Cuckoo Line, giving that line an occasional through service from London. Trains also ran to Tunbridge Wells via East Grinstead, with the Three Bridges to East Grinstead line usually operated by a shuttle. A shuttle also operated between the two Tunbridge Wells stations, as well as some through trains from Brighton via Lewes to Tonbridge, and occasionally even Maidstone or Chatham. The pattern changed a bit after electrification of the Brighton main line in 1933 (see The sparks effect) in that through trains to Brighton no longer regularly used the East Grinstead-Horsted Keynes-Hayward's Heath line. But the line was considered important as a diversionary route for the main line, and the section from Haywards Heath to Horsted Keynes was even electrified in 1935. The one line in this network that was little used was the one going south from Horsted Keynes to Lewes, which had just a few trains a day. It had always been a backwater, with only one of its stations - Barcombe - being near a village. The other two - Sheffield Park and Newick and Chailey - had been built purely to serve the country houses of the line's aristocratic backers. As early as 1955 British Railways tried to close the line (as well as ceasing passenger service from Horsted Keynes to East Grinstead), but were stopped by local resident Margery Bessemer, who discovered a clause in the 1878 Act of Parliament giving permission for the route requiring them to run at least four trains a day in each direction. BR then ran what was known as the “sulky service” – the bare legal minimum – until it could change the law and close the line legally in 1958. This closure started to change our view of railways, because almost immediately a group of volunteers got together to reopen a part of the line, and in 1960 the Bluebell Railway was created. It was not the first volunteer steam railway – that honour goes to the Talyllyn, a narrow-gauge track in North Wales which was saved in 1950 - but the Bluebell started a trend that has spread all over the country. In the south east alone there is the Mid-Hants Railway from Alton to Alresford, the Spa Valley Railway from Tunbridge Wells to Eridge and the Kent & East Sussex Railway from Bodiam to Tenterden. Nearly all of these companies originally aimed to re-start scheduled services on their lines, but they soon discovered another market as tourist attractions, tapping into the nostalgia for steam locomotives that disappeared from the rest of the railway network in the mid 1960s. For the other lines described above the future seemed bright in the late 1950s - at least to HP White, the author of A Regional History of the Railways of Great Britain: Volume 2: Southern England. After noting the closure of the Horsted Keynes to Lewes line and that "a voluntary society has bought the section between Horsted Keynes and Sheffield Park", he wrote: "At least the immediate future seems assured for the rest of the system. The basic flow is to London and inter-urban traffic is growing, for stations are conveniently sited, services are frequent and fares competitive." Data in the book shows a 61 percent rise in ticket sales at Forest Row station from 1955 to 1957, for example, and a 35 percent rise in season ticket sales. Beeching took another view, however (some speculated that he had to close some lines in the south for political reasons, given that so many lines were being closed in the rest of the country), and in the mid sixties the closure notices went up. First to go was the shuttle from Horsted Keynes to Haywards Heath, one of the very few electrified lines to close, which ceased service in 1963. At the same time the line from East Grinstead to Haywards Heath ceased to be used as a diversionary route. Next was the Cuckoo Line, which closed in 1965, the timetable having been revised in 1964 to make connections at either end of the line inconvenient (a common British Railways tactic at that time). The last train carried the poignant words “Farewell, faithful servant” though by this time the line had only 23 season ticket holders. It probably did not help that at least two of its stations - Rotherfield and Mayfield - were far from the villages they served. But contrast its fate with that of the Guildford to Havant line, similarly dozy in Victorian times, which became the main line from Waterloo to Portsmouth after electrification in 1937 (see The sparks effect). Two years later the line from Three Bridges via East Grinstead to Groombridge was also closed. The Beeching report found that only 25 passengers a day used trains between East Grinstead and Tunbridge Wells, though 300 travelled from East Grinstead to Three Bridges. The entire length of the line can still be followed on foot or bicycle. All these cuts left only three of the former LBSCR lines still running. The one from East Grinstead to London was a popular commuter route (and Beeching's own route to work: see The controversial Dr Beeching), so closure was never considered there. But the lines from Hurst Green to Tunbridge Wells and from Lewes to Tunbridge Wells had never been electrified and ran through quiet rural territory. The towns at the ends of the lines had adequate rail links via other routes, and they were both branded by Beeching as “unremunerative”. In 1966 British Railways applied to close them. Helping their case was the fact that the section from Lewes to Uckfield was doomed anyway. In 1964 a new road bypass was being planned around Lewes, which would cut across the Lewes to Uckfield line. To provide a bridge over the railway would have cost £135,000 on top of the £350,000 costs of building the road. Another option might have been to re-route the line using a track abandoned in 1868 into the Wivelsfield to Lewes line, but that would have cost £95,000. The government refused to fund either option, and the Lewes to Uckfield line closed in 1969. The folly of this decision was highlighted only three years later when an accident closed the Brighton main line for a month. That should have been the final nail in the coffin of the remaining lines between Uckfield and Hurst Green, but it was not. Some 3000 objections to closure were received, and for the first time protestors used cost-benefit analysis to argue their case. They showed that the cost of closure in extra travel hours for passengers would be twice as much to the economy as keeping the loss-making line open. Government ministers hemmed and hawed, and in 1968 gave way, one of the rare examples of a closure recommended by Beeching being halted by public pressure. With the line saved, the dominant pattern of service was to run trains from Uckfield to London Bridge, as happens today, bypassing Groombridge and Tunbridge Wells West. The once busy line through Groombridge was reduced to an hourly shuttle from Eridge to Tonbridge via the two Tunbridge Wells stations. This lasted until 1985 when the track and signalling needed replacing and it was decided that the cost could not be justified. To widespread consternation the link was closed - the last line closure carried out by British Rail anywhere in the country. Most of the route - the section from Tunbridge Wells West to Eridge - was taken over by the Spa Valley Railway, which now runs a steam service on it. The line to Uckfield survives in normal passenger use, however – still unelectrified, and still serving its dozy rural halts. It had a doubtful period in the late 1990s and early 2000s when its trains were old, its stations run down and it had no Sunday service for most of the year. For a time it looked as if it might be closed after all, but somehow it survived and was given new trains and smartened up stations. In the winter of 2015-16 Network Rail even extended the platforms on the line to take ten carriage trains. There is talk of electrifying the line as part of a "Thameslink 2" or "Crossrail 3". 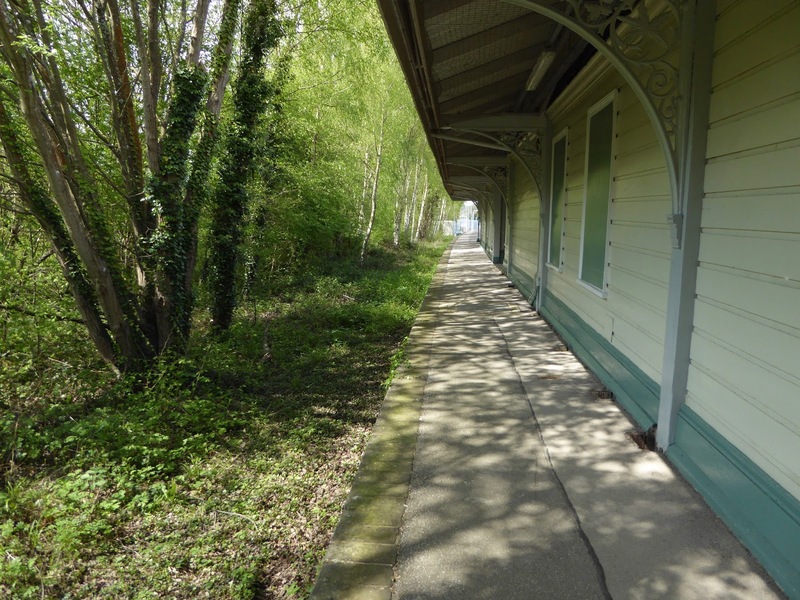 The reopening of the Uckfield to Lewes line has been proposed several times. In 1987 Network SouthEast agreed to contribute £1.5m, a quarter of the projected cost, but local authorities would not fund the rest. In 2000 the train operator Connex promised to conduct a feasibility study into reopening the line in their ultimately unsuccessful bid to retain the South Central (now Southern) franchise. In 2008 a government enquiry looked at reinstating the link but decided that the £140m cost could not be justfied by the two percent increase in traffic expected. In 2017 a study into capacity constraints on the London to Brighton main line concluded that trains via Uckfield would be slower than the current Brighton line and so not viable competition for the existing route. Despite this the pressure group Railfuture also continues to campaign for the Uckfield to Lewes link to be reopened, perhaps as an improved route to Newhaven or as part of development plans for the area. The Outer Circle may yet live again.